Our Christmas lights are twinkling. It's calm, quiet, and clean here. All wrapped up in the craziness of this month, I'm actually finding an ounce of peace, flickering like some candle that could burn out any second. Even so, I am clinging to it for dear life because it's real and it's here. There's Christmas music on repeat. Some of my favorite lyrics of all time ring through the house. Triumphant. Expectant. His law is love / And His gospel is peace. I meditate on these words. Sing them over and over again in my head, knowing they are true. I've been considering the law, the gospel, and the fruit of the Spirit so much recently. I am having realizations that leave me in awe of the way our God has knit this world together. I thought I would be writing about that tonight, but I'm not ready. I need to meditate on it more and that's okay. I'm giving myself that grace. So, I went digging through some old writing archives for something to share with this recipe. I wrote the following paragraphs a few months ago, but I think a piece of them still rings true. The hospital is healing me and humbling me -- making me realize that I never could have dreamed up living this life next to medicine. We always knew we would take this walk. We always knew we would live this life. We knew, but we didn’t really know. This life was never our dream. We are fighting harder than ever -- the chronic soul amnesia that Ann Voskamp so perfectly describes. "I am of the chronic soul amnesia, ever the losing of memory, ever the surprise of remembering, circling again into the old new ways, always re-found. I empty of truth and need the refilling. I need come again every day, bend, clutch and remember, for who can gather the manna but once, hoarding, and mind store away sustenance for all of their living?" Hours spent re-processing, hours spent re-learning, hours spent re-trying to make sense of the life and marriage we didn’t dream up. Hours spent trying to be present in our truest reality. There are people that need him more than I do right now. This life… smacking our marriage into an unbalanced weight. Maybe I am re-realizing marriage isn’t about creating what’s even… it’s about taking turns to bear the load. Do we ever stop re-adjusting, just to end up back in the same place? At the foot of the Throne. We are adjusting here. Learning how to be in this new city of ours. Cincinnati looks old and occasionally abandoned. It’s uncomfortable at times. We occupy the top two floors of an 1880's brownstone, complete with a wrought-iron spiral staircase and large windows flanked by wooden beams on all sides. Every step in our home squeaks and I'm learning to find comfort it's noise -- an old friend talking back to me in the midst of my ordinary silence. I am the crazy lady who sits to listen to our house. To hear the stories we are writing here. I don’t want to miss them just because we dreamed of something else. We aren’t always fond of our realities. I’m not too fond of the one that takes Luke away from me, drains him, and then spits him back out to me so I can pick up the pieces. But I will always pick up the pieces. On my best days, it’s a joy and honor to dust him off, turn him around, and send him out again. Most days, I am selfish and angry that most wives get to eat dinner with their husbands and I often do not. When my eyes and heart are clouded like this, there’s no one else in the house to blame but him, standing in front of me at the end of long days. After all, he chose this life. Not me. But I chose him and would again, one million times over, so I did choose this. It's my joy and future hope. Stripped of my crap and looking like Christ one day. I see Him most in my Luke. Each day before Luke comes home, I ask myself -- how will I choose to see him today? How will I see the hospital that spends more time with him than I do? Will I look for Him today in it all? Will I look for Christ in the life we didn't dream? The hospital has forced me to ask healing questions about my marriage. It’s an image of conviction in the midst of an earthly attitude. A massive gray concrete picture of conviction. So, yes, the hospital is healing me. It’s making me better. It’s making Luke and I better, together and apart. 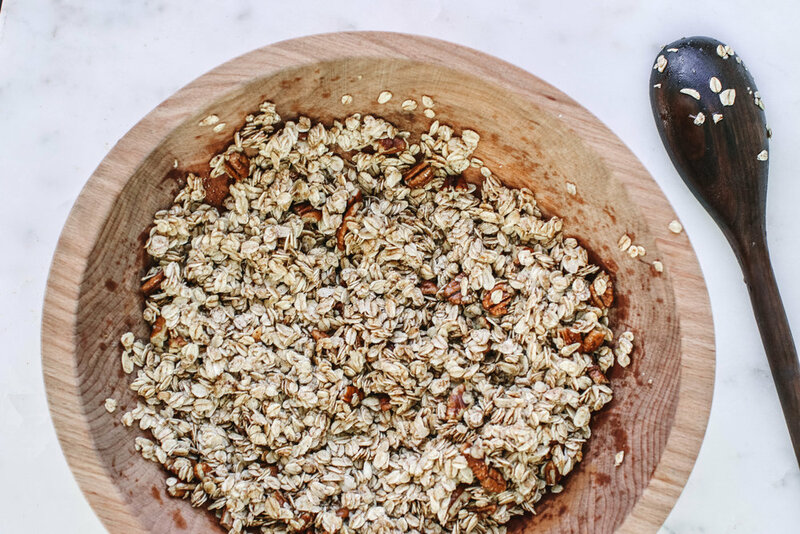 Y'all, praise hands for granola. It is so easy and makes your house smell amazing. To be honest, I kind of just made this recipe up on the fly. Ingredient amounts aren't that significant here. That's why it's the perfect place for a novice cook to start if you are looking to get more involved with your kitchen. Who knows, you might actually start a relationship with your pots and pans. At first, the thought of making something like avocado brownies or beetroot hummus will give you the heeby-jeebies. But then you'll realize you actually like food that sounds interesting and weird and you will bake those avocado brownies and they will turn out all right. Then, when you go out to eat you will not shy away at the Korean place when they put fried fish scales or kimchi in front of you. You will eat it and like it. The rest will be history and you will be cooking up a storm and eating foods with weird names. When your name is mentioned casually in conversation, people will say "Oh, so-and-so, they are a great cook!" or "Oh, so-and-so, they make great granola!" You will realize that it's not about being vegan or paleo or gluten free, but it's really just about trying all the amazing ingredients this world has to offer. I honestly don't know if I believe those mantras -- "everything in moderation" or "half your plate as vegetables" -- but I do believe in this: variety, variety, variety. Variety is a well-balanced diet. And a colorful plate always wins. Let's be honest though, Luke's the real star of the kitchen and I'm just over here arranging cucumbers in a pretty line. This is all you need to know. Rolled oats. Spices. Liquid Sweetener. Oven. Bake. Toppings. Eat. It really is that simple. I used a mixture of maple syrup, honey, and coconut oil as my liquid sweetener here. My extras are pecans, shredded coconut, and dried cherries. 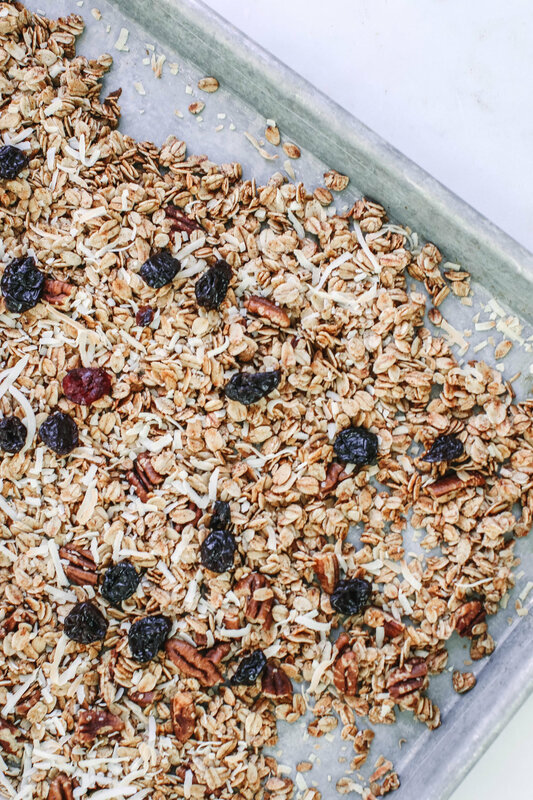 I love to eat this granola with almond or coconut milk. I usually cut up a banana or throw some berries on top. Delicious. 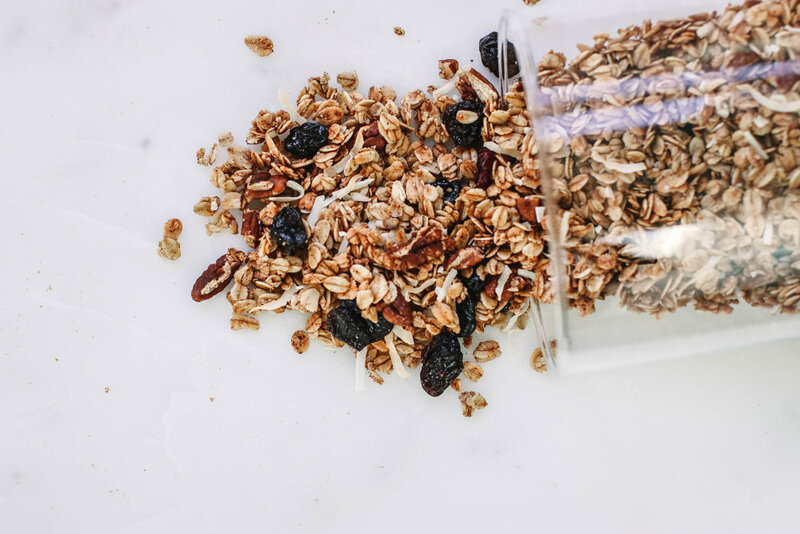 This granola tends to fall on the saltier side, which I love, but you can always adjust the spices and add your own to make it perfect for you! Preheat oven to 300 degrees. 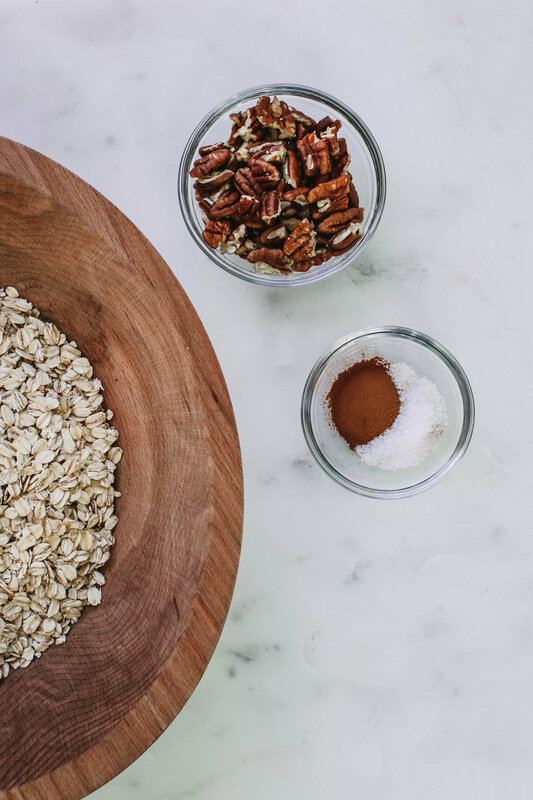 Combine rolled oats, cinnamon, sea salt, and pecans in a large bowl. Sift together. Melt coconut oil over stove on a medium-low heat. Add honey and/or maple syrup. I use both and eyeball the split, pouring half of the honey to a little less than the 1/4 cup marker and adding the maple syrup until it reaches the 1/3 cup mark. Pour liquid mixture in rolled oats. Stir until all oats are covered. Spread oats evenly on a baking sheet. Bake for 30 minutes, stirring occasionally. Add shredded coconut atop oats. Bake until coconut is slightly toasted, about 5-10 minutes. Let cool and add dried fruit of your choice. Enjoy with almond or coconut milk and some fresh cut fruit!